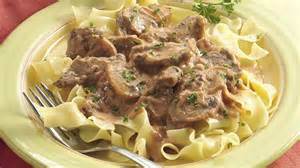 Beef Stroganoff is a Russian dish that combines the trio of juicy beef, mouthwatering sauce, and fresh noodles. While this meal may look simple, it can please even the pickiest of taste buds. If you want to make Beef Stroganoff for family or friends, start with this healthy version adapted from Simply Organic. In a large skillet, heat ¼ cup water on high and brown beef on each side. Add sliced mushrooms and sauté with beef for 3 to 5 minutes. Turn heat to low. Add 1 cup water, juice, and Mushroom Sauce Mix and stir. Blend in sour cream. Leave meat/sauce dish simmering on low heat and prepare egg noodles according to the directions on the package. Serve mixture over prepared noodles when ready. Note: This dish is traditionally served over noodles, but it’s delicious without. You may also substitute the noodles for spaghetti squash or rice.